We've just obtained shocking new video of Lil Pump moments after tear gas was dispersed at his concert ... and it's clear the rapper felt the full brunt of the attack. You see a shirtless Pump rapping and hyping up the crowd as he stands on the edge of the stage, and that's when then the concert comes to a screeching halt as Lil Pump apparently starts smelling the gas. Lil Pump has a puzzled look on his face as he slowly realizes something's not right, he lowers the mic and starts retreating off stage. Backstage, Pump is nearly unconscious as he's getting treated by medics. Fortunately, he's able to recover and he climbs on top of his tour bus and finishes the show. The crazy scene went down Friday night at Rock City in Nottingham, United Kingdom after someone tossed tear gas into the crowd. The crowd may have gotten the worst of it because fans were sent scrambling as gas fills the auditorium. The building was evacuated and cops tell us at least two people were treated for minor injuries. It's still unclear who launched the attack, but law enforcement sources tell us the incident was not terrorism. 11/19 -- The Notts Police Dept. confirmed over the weekend that it was a smoke flare that was discharged inside the venue. 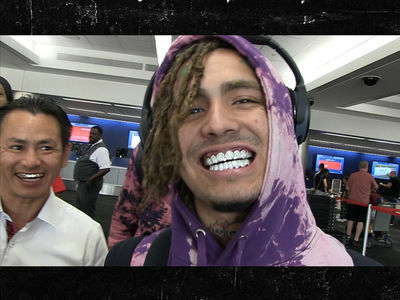 Lil Pump Music TMZ Urban Weapons & Guns Crime Exclusive Nurse!